I have a long list posted on my refrigerator door called "Things I Used to Hate and Now I Love." I'll show it to you someday, it's pretty funny. Most items on the list are a result of irrational decisions I made to be as picky as possible as an otherwise perfectly cooperative 7-year-old. Asparagus was one of those decisions. Obviously, I've since changed my mind. Big time. Asparagus is now one of my favorite veggies (especially the tender, skinny ones), and now that it's in season, it's time to celebrate! This dish is a fresh, bright, springy new weeknight favorite. The original recipe called for goat cheese, so feel free to use that instead of mascarpone for some extra tang. 1. Cook pasta in large pot of boiling salted water until almost tender, stirring occasionally, about 7 minutes. Add asparagus and cook until pasta is tender but still firm to bite, about 3 minutes longer. 2. Meanwhile, combine oil, lemon peel, sundried tomatoes, and chopped parsley in a large bowl. 3. Drain pasta and asparagus. 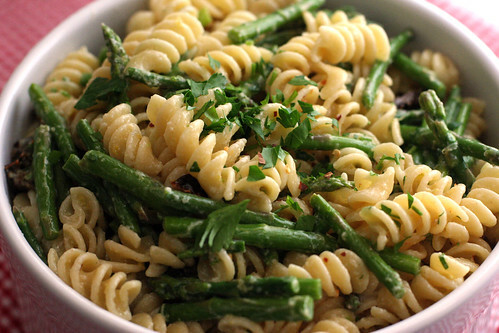 Add hot pasta, asparagus, and mascarpone to bowl with lemon mixture. Toss to coat, distributing mascarpone as it melts. Season pasta to taste with salt or garlic salt, black pepper, and crushed red pepper. Garnish with additional parsley if desired. This sounds so good! And looks easy :) Methinks I'm going to have to make it! I have been eating sooo much asparagus lately! I was one of those weird kids when it comes to food... asparagus and brussels sprouts were my favorite vegetables. I still love both of them very much, but I can't pick a favorite vegetable anymore. I love how this pasta has lemon and sundried tomatoes in it. I can just imagine all that flavor! this just has Spring written all over it. Bookmarked! That looks incredibly refreshing! I can't wait to see this list Amy =D. Asparagus are one of my faves! this recipe is right up my alley in terms of favourite foods. Asparagus, sun-dried tomatoes and feta!?! Yum! As a kid I didn't love asparagus but would, grudgingly, eat it. Parsnips are at the top of my list of 'ew' kind of foods. I'm glad I just happened upon your site. I really enjoy your blog, and have nominated you for the Sunshine Award! We made this last night and it was delicious. Thanks so much for posting!